Material Design has seen the rise in on-scroll animations in Android apps. Certain designs include a parallax scroll effect with a header images, along with Tabs. In this post, we’ll look at just that. Parallax scrolling is a popular pattern. Previously we’ve seen such examples with the Flexible Space with Image and Quick Return pattern. 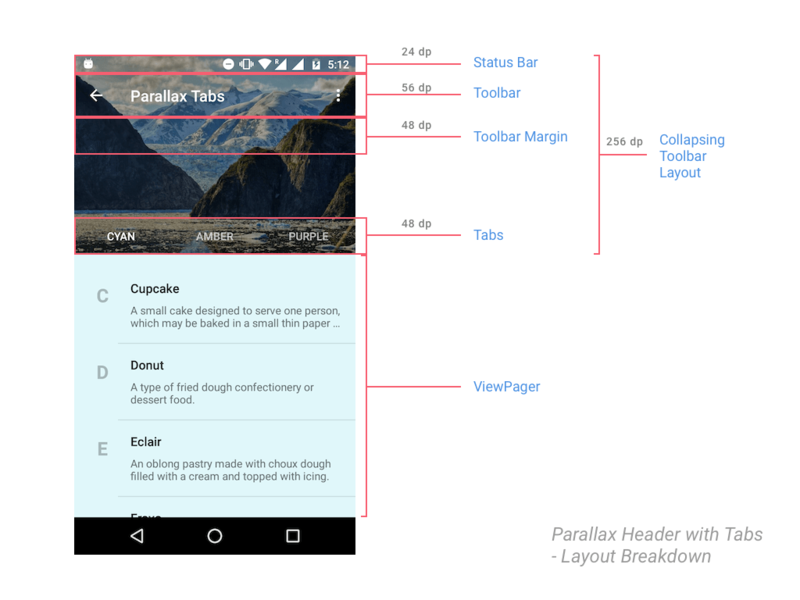 In this post, we’ll look at making parallax scrolling Tabs using Android Design Support Library. Parallax scrolling has been very popular in web design and now in app development as well. I’ve seen quite a few people wanting to implement this and I wanted to provide a solution without using a third party library. So here it is. Creating Parallax Scrolling on Android is nothing but the Flexible Space with Image pattern, with an added TabLayout. 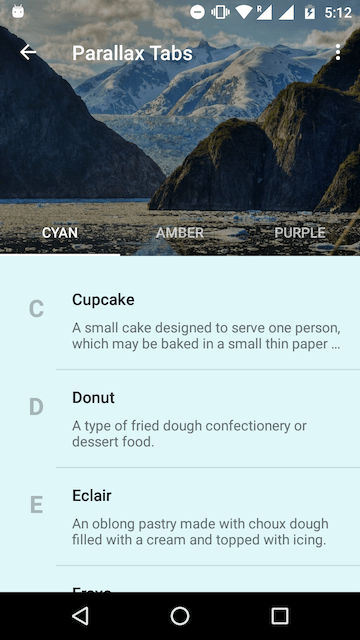 Have you read the android tutorial for creating the Flexible Space with Image Pattern? If you have, then you would immediately recognise that all this needs is a TabLayout. For those who haven’t read it, don’t worry. I’ll walk you through everything in this article. But wait, hold your horses! I just threw in the TabLayout and this is what I got. Unlike the typical Material Design Tabs attached to the Toolbar, Tabs here are transparent. Here is the layout. So clearly, the plug and play doesn’t work. It looks like some tweaks are required. So before I straight away paste the entire code here, let’s look at the layout skeleton. The CollapsingToolbarLayout is like a super FrameLayout. So take note of the ordering of elements inside. Whatever element you place last, is what appears on the top. This positioning is important to get the parallax scrolling to work. So now that you have an idea of the layout structure, behold the full XML layout code! Some of the attributes here make the parallax scroll work. So let me walk you through them. 21. The total height that we want our collapsible header View to have. 25. This is not the Flexible Space with Image pattern. We don’t want the Toolbar title to collapse. We want it fixed. So disable the title. 34. The flag that triggers the parallax effect upon scrolling. 36 – 41 Scrim that makes Tab text more readable against the busy header background. 47. Remember that CollapsingToolbarLayout is an extension of FrameLayout. So this attribute ensures the Toolbar stays on top. 48. TabLayout by default has a height of 48dp. Telling our Toolbar to have a bottom margin of the same, avoids the overlap issue I showed you above. 49. Makes sure the Toolbar consistently is pinned to the top. Otherwise when you start scrolling, the Toolbar scrolls off screen. 56. Ensures the TabLayout sticks to the bottom of the header. In case you forgot, the Tabs need a ViewPager to work with, so let’s take care of that in our Activity.java. Let’s start by creating a dummy Fragment. For the sake of displaying some content, the Fragment will display a RecyclerView. Additionally, it’s background color will change depending on it’s position in the ViewPager. Note that DummyFragment is just a placeholder which I’m using with a different background color for each of my Tabs. You on the other hand must define a Fragment accordingly for each of your Tabs. Finally we’ll attach the ViewPager to our TabLayout in the Activity’s onCreate() method. The setupViewPager() method simply initializes my Fragment and adds them to the ViewPager. The color you see the Toolbar + TabLayout take, is picked from the header image. Courtesy of the Palette API. Notice that the actual Palette API calls reside in the try block. But it is good practice to always handle the fail case. Here, the Palette API can fail if we’re unable to get a Bitmap. So as a fallback, we resort to using our app’s primary colors. With everything in place, run your app and scroll down and watch that beautiful parallax scrolling. We have a neat TabLayout that plays nice with our Toolbar. Our header image scrolls nicely and fades into our image’s primary vibrant color. As you can see this is a neat pattern in use which many of you would have seen. A perfect use case for this would be in apps that have categories (sub divisions) like the Play Store app, and also require a neat header image (Master Detail being the perfect example). Find the source code for this project on GitHub. If you’re not satisfied with the parallax scrolling the Design Support Library provides, or desire a greater degree of control and flexibility, you can use MaterialViewPager by florent37 on GitHub. Do share the post if you liked it! 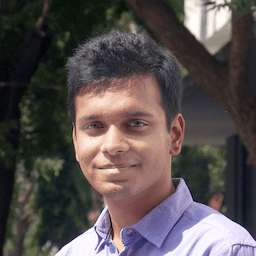 Empathetic Designer and Mobile App Developer focused on creating clear, simple and engaging experiences for people. By default, without me trying to manually adjust the title position, the previous versions of the Support Library wouldn’t fit it correctly. Do remove the positioning attributes and give it a shot, I’ve tested it to be working fine. Am using 23.1.1 of the support libraries. Can you update your github proj with the changes so I can take a look? I just updated to v23.2.0 of the Support library. Haven’t changed anything in my code. Still works like a charm. I’d suggest you go through my GitHub repository and see if you’re doing anything different. When collapsing, the title is still below where it should be. I updated to 23.2.0 of the support library. I also tried it on an Android 4.4.2 (real phone), 5.1 (GenyMotion virtual), and 6.0 (GenyMotion virtual). Did you cross check with the Activity’s XML Layout as well? I left the activity’s XML layout the same as your original source – didn’t make any changes to it. Only changed the above mentioned source line. Personally, I wasn’t able to get the collapsing title to play nice with this animation. So I simply set a title to the Toolbar instead. Yeah, bizarre. Probably a bug in the support library. Same here, vanilla checkout of the repo (a38bd433c13e93a77dec436cb9b6e6744cd6958c), just this one change to get a parallax title — text overlaps with tabs when expanded, sits below toolbar when collapsed. I also updated to v23.2.0 but it didn’t help. I also tested on Android 4.4, 5.1, and 6.0. No luck unfortunately. Like I said, I’ve got the alignment straight after a lot of trial and error. I can confirm that my source code even works with the latest support libraries. I’ve personally tested this for you. So if you’re going to modify the layout, it would obviously break. I can’t quite figure it out. I didn’t change any of your layout. Just one source code change shown above to allow the collapsing toolbar to display the title. I would think the Google Support Libraries should be able to handle it. Perhaps someone else can try it and see what happens. Anyway, won’t bother you anymore. Thanks for the tutorials, they are really helpful. When the title collapses, it appears below the toolbar. See screenshots. I tried playing with layout_gravity and gravity but didn’t seem to work. How do I properly collapse the title back into the proper position? Yep, same here, still today, latest checkout and just that one change. Except in the last screenshot (expanded layout), the title even touches the tab labels. Setting the Collapsing Toolbar title to false is what enables me to do this animation. You can alternatively set the Toolbar’s title instead. Is it possible to change the header image once the user slides between tabs? Yes, you could do that via your code. Create a tab listener and change the image depending upon which tab is selected. is it possibl e to show tabs dynamically based on the selected list item from another view. Please refer to my GitHub code sample linked below. Did you go through my code sample first? If you did, you shouldn’t be facing this issue. Thank you for this article. But it’s not working I copied the same XML layout. BTW I’m using Support Library v23.1.1. I suggest you go through it once again. I’ve updated my libraries to 23.1.1 as well and experience no such issues. Still works like a charm. Alternatively, you could consider seeing my GitHub sample project. Thanks for that useful gist for your code. Since you’re using a DrawerLayout, why don’t you inflate your Coordinator layout part from a Fragment? Makes it more clean and easier to isolate the error. That’s good to hear Saiteja. Happy to know you were able to resolve the issue. If you really liked the tutorial, do consider sharing so others find this blog too. Great tuto, thanks a lot! Please update to the latest support libraries versions first.